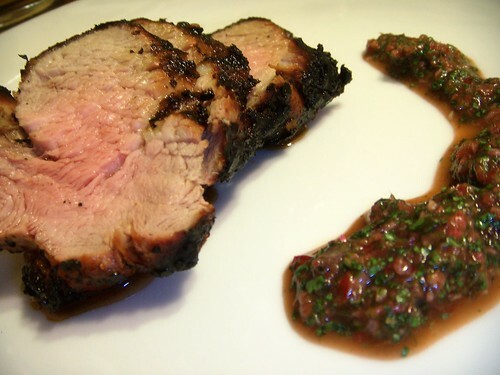 grilled pork loin with cherry chimichurri sauce, originally uploaded by aarn! +9th January, 2009+. marinated a 1-lb pork loin in crushed garlic, molasses, olive oil, salt, fresh cracked pepper, and a splash of white balsamic vinegar, for about 30-minutes while prepping other ingredients. placed the loin on a hot grill and cooked until the entire outside was nice and colored, then lowered the heat, still turning the loin every so often, until an instant read thermometer in the thickest part read 150-155 degrees F, then tented at room temperature in aluminum foil for 5-10 minutes, sliced and then served on a warm plate with some sauce. the sauce was kind of a spin, not a traditional chimichurri. blended a length or two of scallion, a small clove of garlic, a handful of fresh cilantro, and a handful of stemmed and pitted fresh cherries. then added the juice from 1/2 of a lime, 1t. olive oil, 1T. sugar, salt and pepper, and blended until relatively smooth, then chilled until use. stirred well and then plated.